Despite their glorification by Hollywood films, hallucinations are rarely fun while you’re having them. When the realization sets in that you are seeing and experiencing things that others are not, the natural reaction is fear. In this post, we are going to teach you about hallucinations: what they are, what they mean, and where they come from. “Hallucinations involve sensing things such as visions, sounds, or smells that seem real but are not. These things are created by the mind. Feeling sensations in the body, such as a crawling feeling on the skin or the movement of internal organs. It is easy to get scared when you hallucinate. This is because we have been conditioned to think of them as a signal that something has gone horribly wrong with your brain. It’s true that sometimes hallucinations can be a sign of distress. Sometimes, though, they can be completely normal. One good example of this is hearing a loved one’s voice when they have recently passed away. This is a normal part of the grieving process as is smelling scents you have associated with that person. Hallucinations are typically a by-product of something else. For example, people with schizophrenia frequently have full sensory hallucinations (2). Before you get scared and assume that you have a severe mental disorder like schizophrenia, you need to understand that hallucinations can also be brought on by very common conditions. For example, people who suffer from very high fevers will often experience visual hallucinations while feverish. Hallucinations are also common among the extremely sleep deprived. In fact, experts say that hallucinations start to happen when people go more than 48 hours without sleep (3). To that end, people who suffer from narcolepsy also report experiencing hallucinations. 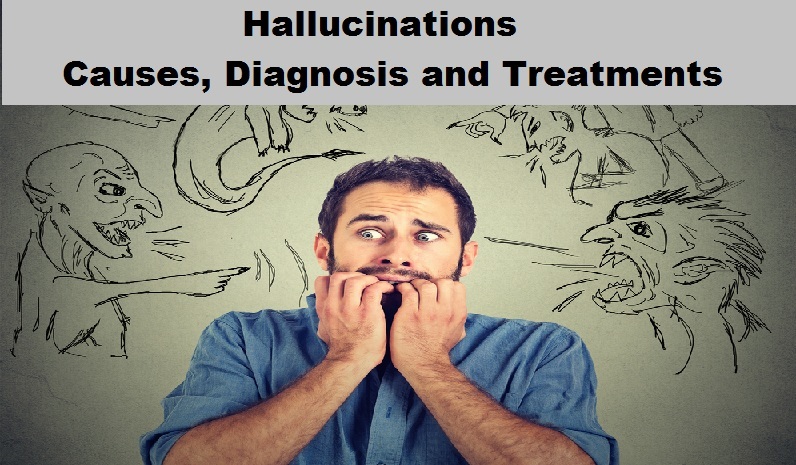 Hallucinations are also common reactions to the effects of certain drugs like LSD, heroin, PCP, and even lesser narcotics like marijuana and alcohol. In fact, experiencing hallucinations is one of the signs that you are starting to “come down” or withdraw from these drugs. Finally, hallucinations can be a symptom of physical and neurological health issues. People who are epileptic often hallucinate scents or smells. People who are blind or deaf have also reported having hallucinations. Severe physical illnesses like liver failure, kidney failure, advanced HIV/AIDS and, of course, malignant brain tumors have all been known to be behind a person’s hallucinations. As we have already said, experiencing a hallucination isn’t necessarily a sign that something has gone terribly wrong. The first thing you need to do is evaluate yourself. Do you have a high fever? When was the last time you slept? Have you used drugs recently? Do you suffer from a disease like Parkinson’s or Epilepsy? Asking yourself these questions can help you calm down and get a better gauge on what is going on. That said, if you are experiencing hallucinations, you should absolutely call your doctor–even if you’re pretty sure they’re a result of your not having slept. It is always better to be sure and your doctor will likely agree. The first doctor you will need to visit is your general physician. Your general physician will go over your physical health history as well as a basic mental health evaluation. Then you will likely be put through some tests. Common tests for people reporting hallucinations are EEGs, and MRIs (3). The EEG (formal name: electroencephalogram) is a non-invasive test and is similar to the EKG. Your doctor will put electrode sensors around your head and then hook those sensors up to a monitor. The monitor measures the electrical activity in your brain. This test is often what will reveal seizure episodes–and yes, it is possible to have a seizure without realizing it! If the EEG is inconclusive, you will likely be sent for an MRI. If you’ve ever watched a medical show–it doesn’t matter what kind–you likely have at least a basic idea of what to expect when you go in for your MRI. The MRI uses magnets and radio waves to take “pictures” of the inside of your body. It is more detailed than an X-Ray and will tell your doctor if you have any tumors or other physical reasons for your hallucinations. If a physical reason for the hallucinations is revealed, your doctor will help you develop a treatment plan for that condition. Treatment might be as simple as medication or it could be more invasive, like undergoing surgery for tumor removal. If there isn’t a physical cause for your hallucinations (at least, not one that can be picked up by an MRI or EEG), you’ll need to be evaluated by a psychiatrist. There is no reason to be scared of this interview and evaluation. The psychiatrist is hoping that your hallucinations are easily treatable as much as you are! The psychiatrist will ask you a lot of questions. Some will overlap with questions you answered during your physical evaluation. There will also be questions about your emotional history, whether or not you’ve been through a trauma, etc (4). Do not sit around and hope that your hallucinations go away. 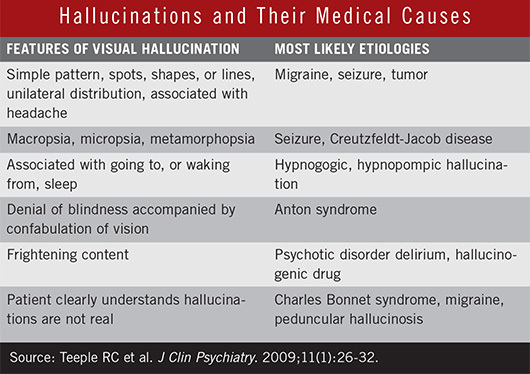 Even though hallucinations can be caused by some easily controllable factors, it is always best to have them evaluated. This way you can make sure that you get the treatment plan that will actually help you.